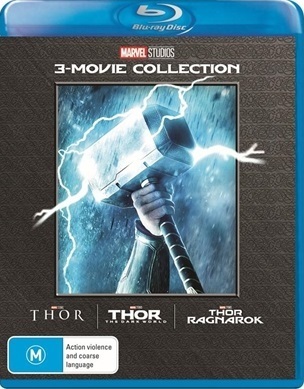 This Thor blu ray triple pack includes all 3 movies. The warrior Thor (Chris Hemsworth) is cast out of the fantastic realm of Asgard by his father Odin (Anthony Hopkins) for his arrogance and sent to Earth to live among humans. Falling in love with scientist Jane Foster (Natalie Portman) who teaches Thor much-needed lessons and his new-found strength comes into play as a villain from his homeland sends dark forces toward Earth. Worlds collide when a powerful ancient enemy threatens to plunge the cosmos into eternal darkness. Now, reunited with Jane Foster and forced to forge an alliance with his treacherous brother Loki (Tom Hiddleston), Thor embarks on a perilous personal quest to save both Earth and Asgard from destruction. Thor is imprisoned on the other side of the universe without his mighty hammer and finds himself in a race against time to get back to Asgard to stop Ragnarok--the destruction of his home-world and the end of Asgardian civilization--at the hands of an all-powerful new threat, the ruthless Hela. But first he must survive a deadly gladiatorial contest that pits him against his former ally and fellow Avenger--the Incredible Hulk! Click the button below to add the Thor 1-3 (Blu Ray) to your wish list.